Based on Thailand’s overall investment cycle, and after considering the various sectors and drivers of the recent recovery, it appears that the ongoing investment recovery is likely to be unsustainable. This is primarily due to cyclical tailwinds, while structural economic and political headwinds remain underlying constraints. The political schism that has prevailed in Thailand hit the economy mainly through the private investment channel. Given this, the upswing in exports has contributed to a recovery, but one that has been uneven across industries and has concentrated in export-oriented autos and electronics, as well as oil-related sectors, which benefitted from rising oil prices. The government’s latest efforts to boost investment are promising, led by a THB2.9trn (18.9% of GDP) nationwide infrastructure investment plan and the much-hyped Eastern Economic Corridor (EEC) initiative. However, signs of large-scale investment have thus far been limited, casting doubt over the EEC’s success, which hinges on the timely implementation of the infrastructure overhaul. 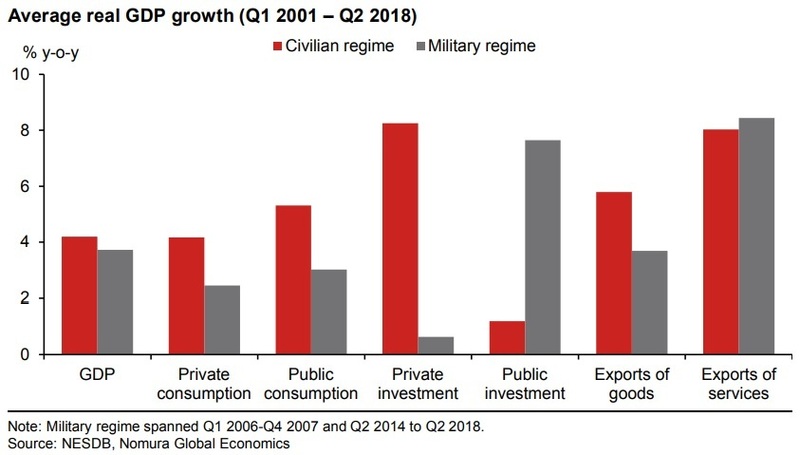 In addition, the government’s falling popularity is leading to a shift in the fiscal spending mix towards short-term populist measures to the detriment of long-term productive investment. Considering the cautious investment outlook, it appears H1 2018 may have marked the peak of the growth cycle. Also, the wide savings-investment gap, fueled by two interlinked issues of ageing demographics and weakening labor competitiveness, should also keep the current account surplus sizeable at 8.4% of GDP in 2018 and 6.6% in 2019 from 11.2% in 2017. Amid broader emerging market risk aversion, Thailand’s relatively large current account surplus and Bank of Thailand’s large foreign exchange reserves and forward book, coupled with relatively limited foreign investor positioning, makes THB less vulnerable to the global risk environment. The possibility of rate hikes is an added tailwind, while a seasonal recovery in the current account surplus can also support THB outperformance into year-end. Overall, an improvement in investment is primarily dependent on cyclical factors and, as structural economic and political headwinds persist, Thailand’s investment cycle remains fragile. For further insights into Thailand’s FX, Rates, and Equity strategy, read more here.